Coming up we'll hear an encore of one of the most important interviews we've ever done on this program. 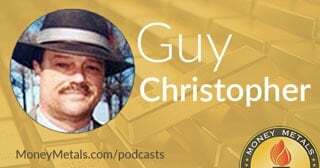 MoneyMetals.com contributor Guy Christopher speaks about personal responsibility, estate planning, and making sure you don't leave your loved ones with a financial nightmare and an unwelcome scavenger hunt. Some timeless wisdom, coming up after this week's market update. As the dog days of summer approach, the animal spirits seem intent on driving the stock market to higher highs in spite of a hawkish Fed. Precious metals bulls hoped for a more dovish statement than the one delivered by the central bank this week. Instead, gold and silver markets took a near-term bearish turn. Now isn’t the time for investors to be sheepish in the face of long-term value opportunities. Disciplined buying in bullion will ultimately be rewarded with more than a dead cat bounce. Investors who are now going hog wild in overvalued financial markets risk getting slaughtered like pigs. They would do well to re-direct their animal spirits to gold and Silver Eagles, Australian Kangaroos, Chinese Pandas, and Canadian Cougars. Those on the hunt for a more exotic specimen might find a great catch in the Australian Platinum Platypus or the 2-ounce Queen’s Beast Dragon silver coin. All of the aforementioned coins, plus many others, are currently available through Money Metals Exchange. And premiums right now are as low as ever. Well, as noted earlier, the Federal Reserve delivered its expected quarter point rate hike with a somewhat hawkish tone. Fed chair Janet Yellen warned markets that she would soon begin reducing the central bank’s massive balance sheet. Nightly Business Report: The Fed hiking the target range for the Federal Funds rate by a quarter point to between one and one and a quarter percent. The Fed's forecast suggests it may hike one more time this year for a total of three increases. The rate hikes could mean higher monthly payments for credit card users and people with home equity lines of credit or adjustable rate mortgages. The Fed was looking for inflation at about 2% this year, but now believes inflation will be a little less than that. The Fed also announcing a detailed plan to wind down its balance sheet this year, selling off some of the assets the central bank bought to stabilize the economy during the financial crisis. Right now, the Fed is sitting on more than $4 trillion. Janet Yellen: We currently expect to begin implementing a balance sheet normalization program this year. Janet Yellen might call it “normalization,” but it would effectively amount to quantitative tightening – a reversal of quantitative easing programs that continue providing stimulus through reinvestments. If the Fed proceeds too rapidly with normalization, stock and bond markets might not cope well. The unwinding of the Fed’s massive balance sheet represents potentially a much bigger danger than another quarter point rate hike. For now, complacency continues to rule markets. Measures of investor fear such as the VIX volatility index remain near historic lows. As a consequence, gold and silver markets haven’t seen a major safe-haven buying surge in quite some time. Gold prices have remained in a range of between about $1,220 and $1,300 per ounce this spring. Prices currently come in at $1,255, lower by 1.0% this week. Silver shows a weekly loss of 3.0% to bring spot prices to $16.76 an ounce. Platinum is off 1.7% to trade at $928. And palladium continues to outperform, hitting a multiyear high earlier in the week but is off now by 1.2% since last Friday’s close to bring spot prices to $874 an ounce as of this Friday morning recording. The rest of the precious metals complex will need a new catalyst to get sustained summer rallies going. The summer period is typically quiet in metals markets. But buying interest could pick up later this summer. Although if recent history holds we could see a rally in the metals following this week’s interest rate hike, just like the rallies we saw immediately following the three previous hikes that have taken place over the last 19 months. If the Senate fails to deliver anything on healthcare or taxes before going into recess, that could certainly disappoint stock market investors and perhaps trigger some flight into gold and silver. If the Bitcoin bubble bursts this summer, many of those who abandoned hard currency for crypto-currency over the past couple years could come back home to hard currency. The inflation trade could also begin to slowly re-emerge. Summer driving season typically means higher demand for oil and gas. Crude oil prices have sold off over the past month and may be due to rebound. The entire commodities complex is extremely depressed, with the CRB commodities index at generational lows versus stocks. Low prices for hard assets means under-investment in future production as mines shut down at the margins and exploration and development budgets are slashed. Huge supply deficits are likely in store for base metals and precious metals over the next couple years. The impact on prices will be significant when it finally comes. For now, long-term investors are well advised to maintain their long-term perspective. The summer doldrums are the time to exercise patience, avoid getting shaken out of your positions, and add to your holdings as opportunities present. Mike Gleason: Well, I'm excited to have you on today because you just authored a fantastic piece for us this week titled, You Worked to Have It... Now Work to Keep It. In that, you described how many Americans, who may have been thoughtful and diligent when it comes to accumulating some wealth, are often totally neglectful when it comes to protecting it. Talk about that. What do you mean, and what is it that so many people often overlook?